Exposed surfaces shall be smooth and free of scratches and shall be ready to receive one of the following finishes: clear anodizing; color anodizing; acrylic baked-on enamel; high solids' polyester coatings; two-coat fluoropolymer and/or three-coat fluoropolymer coatings. Fluoropolymer coating must meet the high performance requirements of AAMA 605.2. Acrylic enamel and high solids' polyester coatings must meet the requirements of AAMA 603 specifications. All frame sections shall be extruded aluminum 6063 T6 alloy and temper. All fasteners exposed to view or weather shall be stainless steel. All other fasteners to be carbon steel with a cadmium and yellow iridescent chromate finish. Glazing gaskets are typically neoprene (exterior) and EPDM (interior). The aluminum framing system shall be manufactured by Gardner Metal Systems, Acworth, Georgia and shall be erected in accordance with GMS approved shop drawings and installation instructions. GMS 600 Series is a unitized system that can be utilized for curtain walls and strip window applications. The system profiles are typically 2-1/2" and 3" wide with depths as required to meet the performance specifications (typically 6" to 8" for captured systems). Through the use of split verticals and stack joint expansion horizontals, this system allows our customers to pre-assemble and/or pre-glaze the wall system at the job site or at an off-site facility. GMS 100 Series is an exterior glazed pressure wall system used for low rise and restoration applications. This thermally efficient stick built system features 2-1/2" and 3" wide, vertical, and horizontal mullions in a variety of depths from 5" to 9" as required to meet design wind loads. 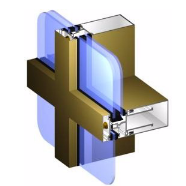 A continuous PVC thermal spacer isolates the interior from the exterior metal too substantially reduce heat transfer, and both interior and exterior glass surfaces are sealed with an extruded neoprene gasket. Sill and head extensions can be added as required. GMS 800 Series is a four sided silicone glazed curtain wall system with no visible exterior vertical or horizontal members. It should be shop glazed under controlled conditions and can be used for projects of any height. The stick built structural members and glass subframes allow for single or twin span vertical mullions with exterior glazing that is installed in sequence. 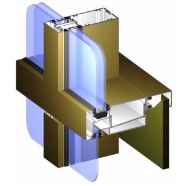 Vertical mullions are 3" wide with a depth to meet the desired load and the interior horizontal profiles can be designed as required to meet the project requirements. GMS 900 Series is a curtain wall system for low rise to high rise applications. This stick system is interior glazed and thermally improved with PVC spacers. This vertical structure is on the exterior side of the glass and is typically a tubed construction. This system is applicable when the architect/owner wants a recessed glass appearance with 6" to 8" deep exterior exposed metal. The exterior is sealed with continuous neoprene gaskets and the interior with a continuous EPDM wedge.